my brother's baby sweater, found pale yellow pillow case with black embroidery, oil cloth. Machine pieced, hand embellished, hand appliquéd using beads. 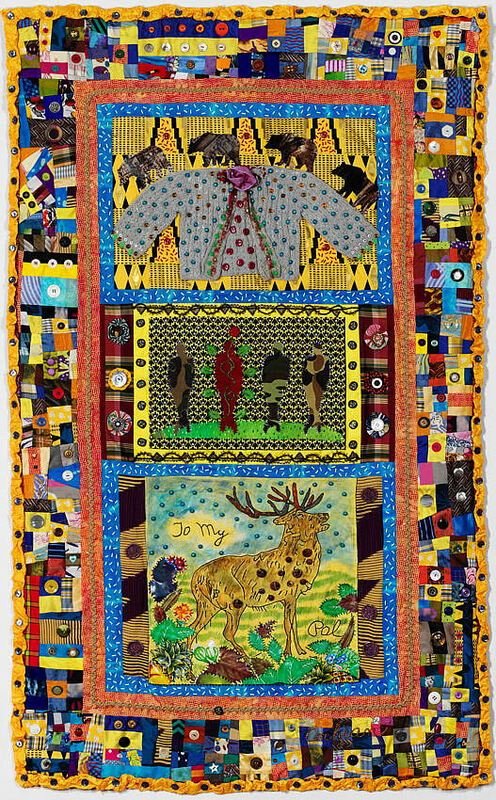 Jane Cochran explains: "Totem is three images that I had put together separately and then they just seemed to go together as one quilt. I loved using the baby sweater and the pillowcase with the very primitive embroidery (which I colored and embellished). The sweater did belong to my brother and my mother gave it to me to use. I didn't realize until I finished the quilt that the pillow case really says 'to my deer (dear) pal' —I thought the animal was an elk.The center image with the men is something I started as a demo for a class I was teaching and just evolved. I see the quilt as the story of some man's life. "We have a cabin in Montana now (although we still live in Kentucky), so the bear is something that has entered my life and thoughts. I did see my first bear crossing the road a few summers ago, and one did come onto our deck.We do have signs that they are around, but everyone says you just say "Shoo Bear" and carry your bear mace when walking."